The global market for chemical sensors features a highly fragmented vendor landscape, with the top five players collectively accounting for a mere 19.8% of the overall market in 2015, observes a recent report by Transparency Market Research. These market leaders, namely Emerson Electric, Co., ABB Group, Honeywell International, Inc., Siemens AG, and the Bosch Group focus on development of new products, innovation through extensive R&D activities, implementation of new technologies, expanding production capacities, and geographical reach to retain their leading stance. Transparency Market Research pegs the valuation of the global chemical sensor market at US$16.3 bn in 2015. The market is expected to expand at a healthy 5.0% CAGR over the period between 2016 and 2024, rising to an opportunity of US$24.8 bn by 2024. From a geographical standpoint, the North America market is presently the leading contributor of revenue to the global market. The region accounted for a 38.2% of the market in 2015 and is expected to exhibit a 4.4% CAGR over the forecast period and remain the leading regional market by 2024 as well. It is, however, expected to witness a decline of about 2% in its global share by that period, with the Asia Pacific market gaining a similar share in the global market, exhibiting a promising 5.9% CAGR from 2016 through 2024. In terms of end-use industry, the oil and gas industry is presently the leading consumer of chemical sensors as the industry employs best possible ways of monitoring and controlling the presence of hazardous chemicals on internal as well as external surroundings. It is estimated that the opportunity of the chemical sensors market in the oil and gas industry will expand at a 4.5% CAGR over the report’s forecast period. The market for chemical sensors has significantly increased in the past few years owing to the significant rise in consumption of a variety of chemicals across industries such as automotive, medical, oil and gas, food and beverages, and agriculture. The rising usage of chemicals has compelled industries to adopt effective sensors capable of monitoring and controlling the release and presence of hazardous chemicals in high risk areas inside industries or in water streams in the environment. Active participation of government bodies to ensure that industries follow safe chemical release practices is also driving the adoption of chemical sensors across the globe. One of the key challenges faced by the global market for chemical sensors is the short workable life of most chemical sensors. Factors such as persistent exposure to chemicals, air pressure, varying temperature, humidity, and a variety of contaminants present in the environment damage chemical sensors, deteriorating their quality and reducing their practical lifespan. This factor could dissuade buyers from adopting technologically advanced and typically high-cost chemical sensors. This could be a major concern across the industrial sector in cash-sensitive developing economies or across small industries. 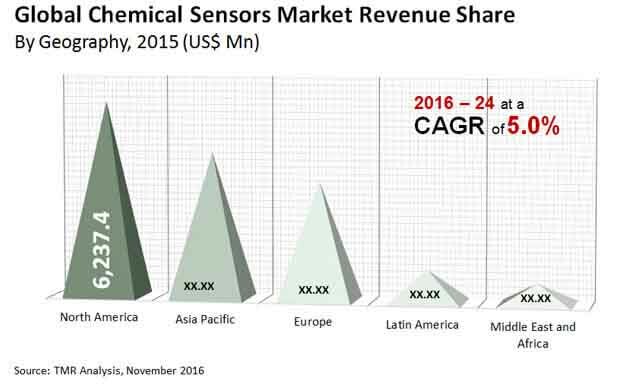 The fluctuations in costs of chemical sensors could also hamper the overall development of the market to a certain extent.